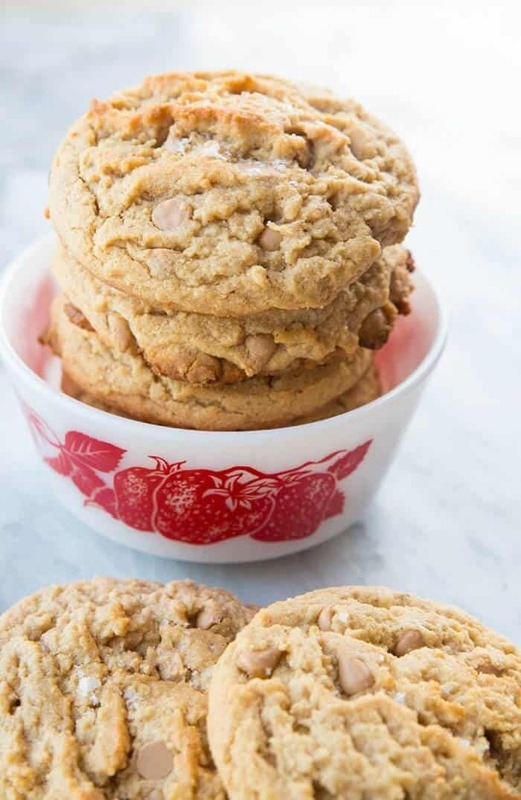 These Sea Salt Caramel Thick & Chewy Peanut Butter Cookies are so decadent! Salt, sweet and peanut butter combine to make some seriously amazing thick and chewy peanut butter cookies! Have I mentioned how much I love flakey sea salt on cookies? Chewy Peanut Butter Cookies are the BEST! I have a confession to make: these only came about because I had sea salt caramel chocolate chips to use up. Stop judging me! Every “New Year” I go through my pantry to see what I have to use up. I don’t like food waste and I hate throwing out ingredients because they are stale. And giving stale donations to the food bank is an even WORSE thing to do! So if you are me, you buy those pre-packaged $10 or $20 Food Bank donations that Superstore or Safeway has all packaged up and then go home and mope about using up everything in your pantry. I had to use up the sea salt caramel chocolate chips that I had in the pantry. Look, I know that I have a problem. I will buy packages of chocolate chips just from the look of them. 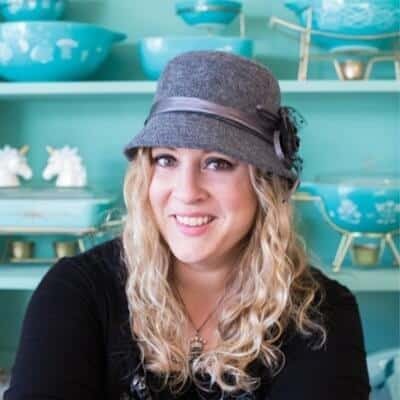 If they are pretty – or if I am shopping hungry- then they end up in my cart. And then a year or three later when I am doing the tri-yearly pantry purge, I find them and I panic. Oh, I always have good intentions of using them, it’s just that as a food blogger you have SO MUCH INSPIRATION that you forget 95% of what you were going to make. I kid you not. So here are my Panic Sea Salt Caramel Thick & Chewy Peanut Butter Cookies. They are AMAZING! Now, if you can’t find those caramel chips…use butterscotch. You bet. 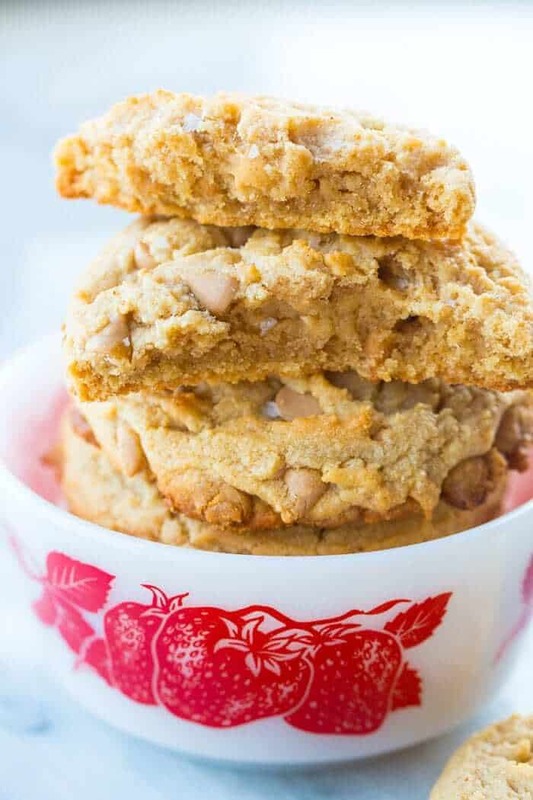 Just sub those butterscotch baking chips into these thick and chewy peanut butter cookies and you will be thanking the good Lord above for inventing cookies AND butterscotch. And salt the tops of the cookies. Always. Flaked sea salt is the one thing in my pantry that I couldn’t live without. THAT gets used up, I never have to worry about flaked sea salt! 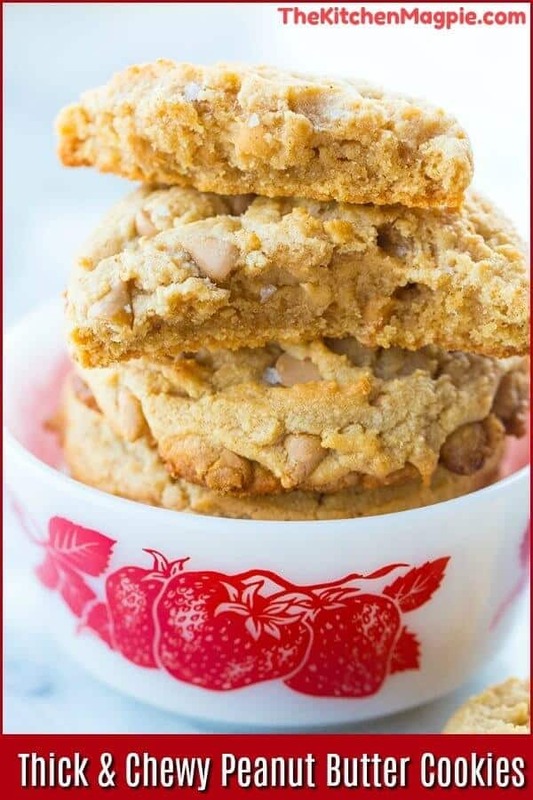 If you are looking for some more awesome cookie recipes, here are some of my favorites! 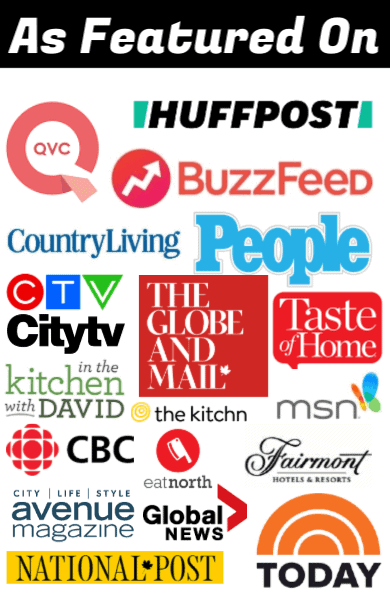 Pin This To Your Dessert Ideas Boards and Remember to FOLLOW ME ON PINTEREST! 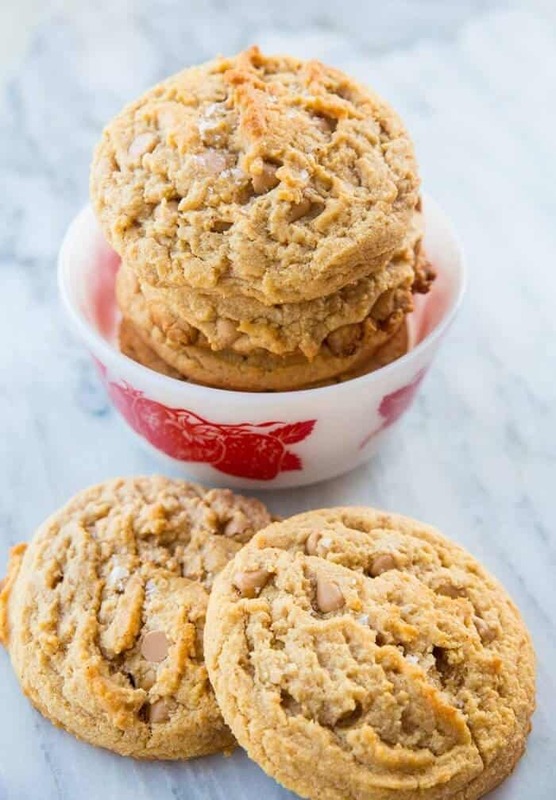 These Sea Salt Caramel Thick & Chewy Peanut Butter Cookies are so decadent! 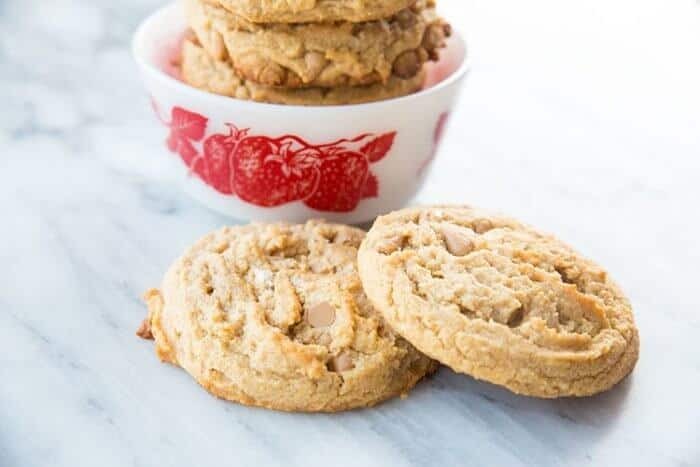 Salt, sweet and peanut butter combine to make some seriously amazing thick and chewy peanut butter cookies! Using the paddle attachment, cream the butter and sugar together in a bowl attached to a stand mixer. Mix in the egg until combined, then add in the peanut butter and vanilla extract. Mix well. Whisk the dry ingredients together then add to the butter mixture, mixing together thoroughly. Mix in the sea salt caramel chips by hand until evenly distributed throughout the dough. Using an ice cream scoop, fill the scoop until it's full, flattening the bottom until it's level with the straight edge of the scoop. Place by rounded cookie scoop onto parchment lined baking sheets. Sprinkle with some sea salt if desired. Bake in the oven for 14-15 minutes, or until golden brown all over. The cookies should still be in a dome shape. Using a flat spatula or egg flipper etc, press each cookie down until evenly flat. They should be about 1/2 inch to 3/4 inch thick. Leave the cookies on the trays to cool completely after flattening. Enjoy your super thick and chewy peanut butter chocolate chip cookies! I love these cookies!! I just made them, and ate one half hot without salt, the salt is a must!! I haven’t tried the thick Caramel Sea Salt Peanut Butter Cookies yet but my Son and I are definitely gonna try them! He loves to bake cookies with me.